Please read the report undertaken by the Cabinet Office and Department of Health (2015) entitled What is happening to children and young people's risk behaviors? Q 1. Why do you think there has been a decline in children's and young people's risk behaviour? Is this trend something that you have observed in practice? Q 1. What does the term Vulnerable mean to you and how does it relate to the service users you are working with? A year later Julie met Boryz, a Polish builder at the local pub and they started dating. Early on into the relationship Julie found out she was pregnant with Lisa. Boryz initially wanted her to get rid of the baby, but Julie insisted that she keep her. After some time, Boryz came round to the idea and subsequently moved into the family home. At first the relationship between Julie and Boryz was good, with Sasha having happy memories of going on outings and picnics. She recalls some arguments, but nothing significant until Boryz failed to find work some years later. During this time the relationship began to deteriorate, with Boryz drinking heavily and blaming Julie for 'trapping' him by having a baby. The arguments often became violent with Boryz hitting Julie. Although neither Sasha nor Lisa witnessed this, they could hear the arguing and their mother crying afterwards. Sasha and Lisa became very close as a result. Boryz finally left the family home and returned to Poland when Lisa disclosed the violence to a teacher at school. This was two years ago. Since then Julie has suffered from depression and has blamed Lisa for causing Boryz to leave her. She feels that Lisa has ruined her life. Julie has begun drinking alcohol heavily and after one bout told Sasha that her father was probably not her dad, but she was the result of Julie being raped, something she has never told anyone. Sasha is struggling to deal with this and her mother’s moods and alcohol use, and is thinking of moving out. Last week during a PE session, the teacher noticed that Lisa had scarring at the top of her thighs. When questioned about this Lisa had broken down and said that she did it because it helped her. She said that her sister Sasha was planning to move out of the family home and that she would have no one left. Lisa also said that her mother hated her and because of this she felt that life was no longer worth living. The school have rung the local children's services with their concerns about Lisa. Jot down your initial thoughts and responses to the following questions in your Personal Blog. Q 1. What different types of abuse can you identify in this case study? Q 2. What possible risks are there for those involved? Q 3. Is there evidence of vulnerability? (3) Reflect on your own practice. Q 1. What types of assessments do you undertake? (4) Please read the following case study. Tariq and Julie's children were removed from their care following violent incidents from Tariq towards Julie. This was compounded by poor conditions in the home, which was also used by young people to misuse substances. Tariq and Julie moved to get away from their present environment because this was one of the main concerns of the professionals investigating the case. However, this was not acknowledged in subsequent child protection assessments and this has made them angry and disillusioned. Following further violence, Julie evicted Tariq and was hopeful she could regain the care of her children. She found questions asked as part of the ongoing assessment process offensively intrusive, to which she responded angrily or tearfully. Whilst accepting that Julie had done all that was asked of her, the care proceedings continued on the grounds of her 'hostility', making it impossible for her to work with Social Care if the children were returned on a Supervision Order. In the Discussion Board share your thoughts about the following question with your peers. Taking into consider the key principles which should underpin assessment, how could Tariq and Julie's situation be dealt with differently? (5) Make a list of everything you need to be able to survive a week. Include everything you think is relevant. Q 2.Why they are relevant to you. Whether or not the needs are things that you just want, rather than those that you really need. Q1. Can you think of an example from your practice when Maslow's hierarchy of needs has helped to explain a service user or patient's situation? Q2. What are your thoughts about The Care Act 2014? Q3. 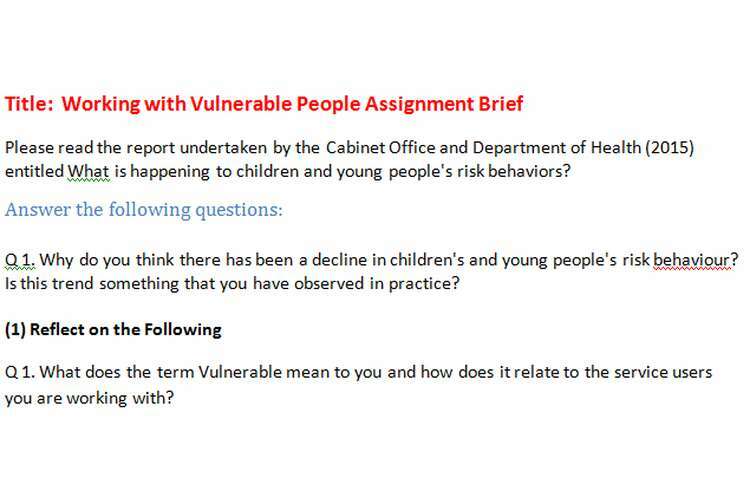 Critically analyze the theoretical aspects of safeguarding, vulnerable service users. This will include discussion of risk, vulnerability and abuse. (7) Safeguarding Children e-Academy (2015) timeline, entitled A history of child protection. Q 1. What does being a Child means to you? Q 2. How and why might differ to your peers perception of Childhood? Q 3. How might this view have been different in past centuries? Q 4. What are your thoughts about the aforementioned concerns in relation to child protection services? Do you agree or disagree? Q 5.Define what is meant by child abuse. Try to avoid just listing the different types of abuse or forms that abuse might take. Therefore, is child abuse socially constructed? Q 1. What are your thoughts on this statement? Q1. What are the main risk factors for Leanne which relate to Parenting Capacity?